'Brambleberry' (Marky Smith, R. 1997). Seedling #91-23A. MDB, height 7.5" (19 cm). Late midseason bloom. 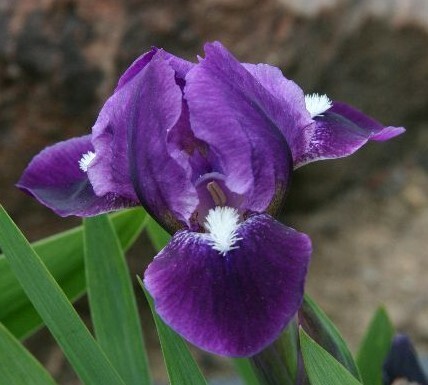 Standards rich red violet (RHS 83B), edged slightly paler; style arms mauve violet, edged cream; falls strong red violet, edged paler, shoulders darker, blacker area around beard, white in throat near beard; beards white, strong yellow in throat; lightly ruffled; slight spicy fragrance. 'Rosie Lulu' X 'Privileged Character'. Aitken's Salmon Creek Garden 1998. Honorable Mention 2000; Award of Merit 2002.